A real or fictitious name of a Jew referred to by Horace as extremely credulous. Credulity seemed to the Roman writers synonymous with Jewish beliefs in general, and "Apella," from Horace's expression "credat Judæus Apella" ("Satires," I. v. 100), became the by-name for a credulous man. It has been suggested that the name is merely an epithet (from a, privative, and pellis, skin) equivalent to the Latin "curtus" (see Porphyry's commentary on Horace, ed. W. Meyer, Leipsic, 1874). This etymology was accepted by Geiger ("Quid de Judæorum moribus, etc.," p. 42) and by Renan ("Les Apôtres," p. 113), but is altogether fictitious, as has been shown by J. A. Hild ("R. E. J." xi. 37) and T. Reinach ("Auteurs Grees et Romains," p. 245), who see in it a very common Greek name of the period, contracted from Apollodorus. Josephus ("Contra Apionem," ii. 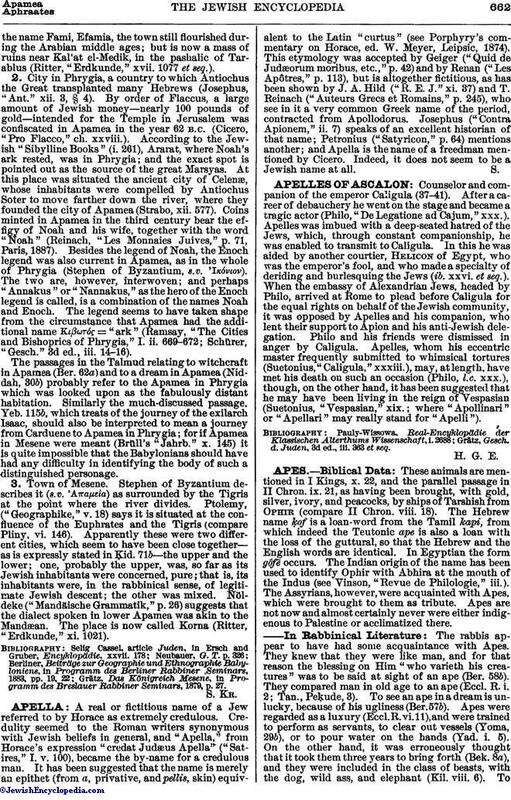 7) speaks of an excellent historian of that name; Petronius ("Satyricon," p. 64) mentions another; and Apella is the name of a freedman mentioned by Cicero. Indeed, it does not seem to be a Jewish name at all.